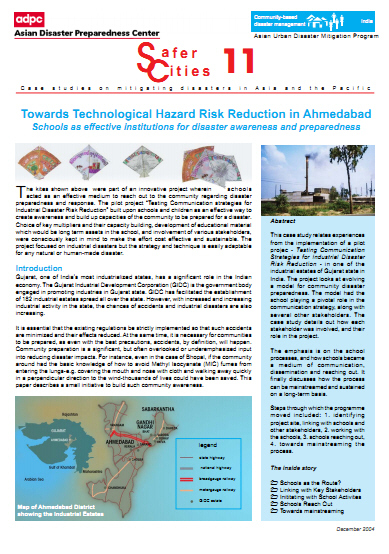 This case study relates experiences from the implementation of a pilot project - Testing Communication Strategies for Industrial Disaster Risk Reduction - in one of the industrial estates of Gujarat state in India. The project looks at evolving a model for community disaster preparedness. The model had the school playing a pivotal role in the communication strategy, along with several other stakeholders. The case study details out how each stakeholder was involved, and their role in the project. can be mainstreamed and sustained on a long-term basis.